Rebecca joined Shepherds in 1998 as a student veterinary nurse and qualified in 2002. She then gained a further qualification as a clinical coach. She enjoys teaching and encouraging people to take on this rewarding career. 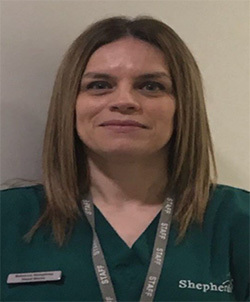 Rebecca was appointed as head nurse in 2015 and her duties include the day to day running of the nursing team, ensuring gold standard of care for all our patients. She has a keen interest in nursing clinics and animal behaviour. Rhia started her veterinary Nursing Career at Shepherds when it was a busy mixed practice. This is where she gained her Veterinary Nursing qualification. 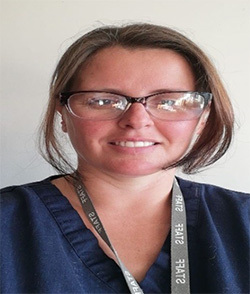 She left Shepherds to join an orthopaedic referral centre in Swansea South Wales, she worked there for over 10 years gaining a high standard of hands on theatre experience. 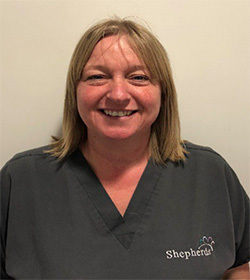 Rhia has re-joined Shepherds in March 2017, she is responsible for running the theatre and ensuring surgical standards are adhered to. 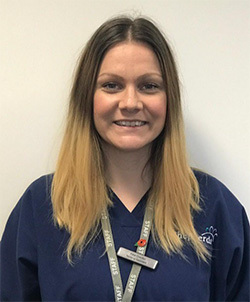 Jodie joined Shepherds the Vets in July 2011.She worked as an animal assistance for a year and then went on to complete her veterinary nurse training at Abbeydale Vetlink College. She qualified in August 2014. Jodie enjoys all aspects of her job but her main interests are critical and emergency care and anaesthesia. In her spare time, she enjoys spending time with her family and partner and going to different places for weekends away especially zoos! When at home she enjoys keeping fit at the gym. Ashley has been with Shepherds since December 2012. He graduated from Abbeydale Vetlink, Monmouthshire in April 2016. Ashley has become our dedicated Emergency & Critical Care nurse during the nights, and is referred to as ‘the vampire’ of the team. He says “No night is ever the same, you never know what you’re going to be faced with. That’s what I love!” As an emergency & critical care RVN, his role is to provide immediate triage, emergency care & treatment if your pet needs us. 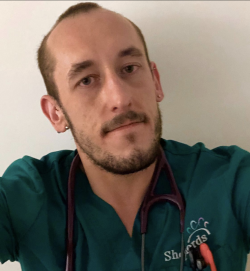 He works closely alongside the on-call veterinary surgeon and has the support of a student nurse throughout the night. He is starting a new challenge to gain his Certificate in Emergency & Critical Care. Kelsey started working in Shepherds February 2016. She sucsessfully completed her training at Pencoed College. Kelsey has many animals at home including dogs, cats, chickens and 2 Micro Pigs. With her personal zoo at home most of her free time is spent with them. Amelia joined Shepherds in October 2016. She has recently graduated in animal behaviour and welfare science from the university of Bristol. 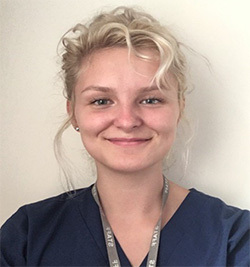 Amelia commenced her Veterinary Nursing course in September 2017. She has a passion for the care and welfare of animals. Lara joined Shepherds in October 2016 as a student veterinary nurse. Lara went to Pencoed college where she completed a Level 3 extended diploma in Animal Management. 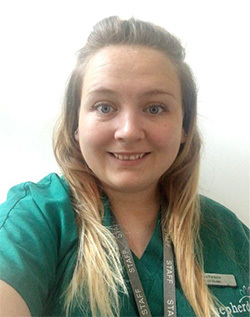 Lara started her diploma in Veterinary Nursing at Pencoed College in September 2017. At home, she has a dog called Ozzy who is a Kerry Blue Terrier and outside of work is spends time with him and her friends. Jodie joined Shepherds in in September 2016 as a trainee nurse. She has previously studied animal management in college. 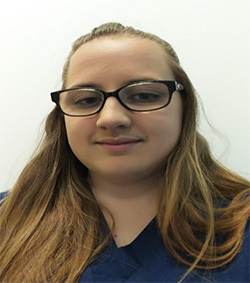 She is due to start her diploma in Veterinary Nursing at Pencoed College in September 2017. In her spare time, she enjoys spending time with my horses and animals at home and catching up on my favourite shows. 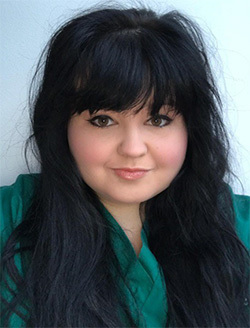 Emma joined the team in May 2018. She has always had a passion for animals and wants to dedicate her life to helping them. Emma will be starting college in September 2019 and when she qualifies she hopes to specialize in feline nursing. In her spare time, she enjoys dressing in 1950's fashion, cooking and playing with her cat Sullivan. 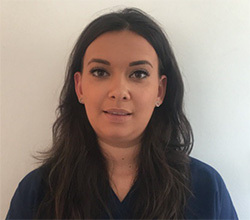 Learna joined the team in March 2018. 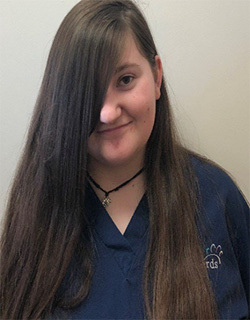 Having had a passion for animals her whole life she decided to pursue her dream of working with animals and will be beginning college in September 2019 to train to be a Veterinary Nurse. In her spare time she enjoys going to the gym and taking her Cocker Spaniel Barney for walks in the Brecon Beacons with her Fiancé. Ellie joined the team in 2018 after years of loving and caring for animals. She decided to put herself to the test and applied for the Level 3 Animal Management course at Bridgend College to fulfil her dream of being a veterinary nurse. She is now on the path to becoming a veterinary nurse whilst working at Shepherds and training as a student nurse. In her spare time, Ellie enjoys spending time with her family and friends along with travelling and walking her dog. 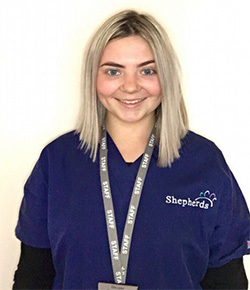 Sadie joined Shepherds in 2018 as a student veterinary nurse. Sadie always had a passion for animals and recently graduated in Animal Behaviour and Welfare from the University of Plymouth. She is now training to be a Veterinary Nurse at Pencoed College. At home, Sadie has three Crazy Jack Russels named Buster, Bertie and Amber. She also has a tortoise called Tank. Outside of work, Sadie spends time with family and friends, along with walking the dogs regularly. 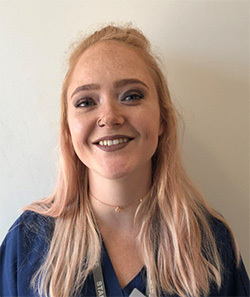 Hollie joined the practice in December 2018, and is due to start college in September 2019 to pursue her career as a Veterinary Nurse. Hollie has always loved animals having had them her whole life and is looking forwards to achieving her qualification. Hollie has a Cockerpoo named Tetley and a Golden Retriever named Waffles. In her spare time she enjoys taking them on long walks and giving them cuddles on the sofa. 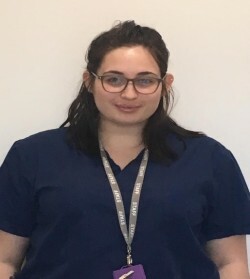 Jess is a final year Veterinary nurse student waiting to complete her final exam before gaining her qualification as a registered veterinary nurse. 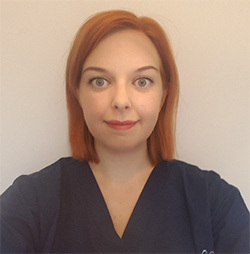 Jess has been working in the veterinary industry for the past 8 years and has a keen interest in feline medicine. Kate sometimes called Skatie. Kate loves all animals and has a fair few of her own including cats, dogs and a horse. Kate is a nursing assistant who works the weekends mostly helping with the emergencies. Kate has recently had a lovely little boy by the name of Jack. Kate has worked for Shepherds for a few years now and her favourite part of the job is meeting lovely animals that come in to us and especially when they go home happy and well. Paula joined Shepherds in the year 2000. She started as a cleaner in The Beaches and has progressed to an Animal Care Assistant in our purpose-built hospital in Brackla. She takes care of all the basic needs of your animals when they come into hospital. She makes sure they are walked, fed and given attention so they feel less nervous about being away from home. Her spare time is filled up with family. All her spare time and energy is currently taken by her grandchild who was born in 2014.